If someone started drinking at Section 8 when it opened and were, say 22, their idea of a good night now might be putting the kids to bed and having a nice wine. They’d be 34 and might have given up collecting trainers. 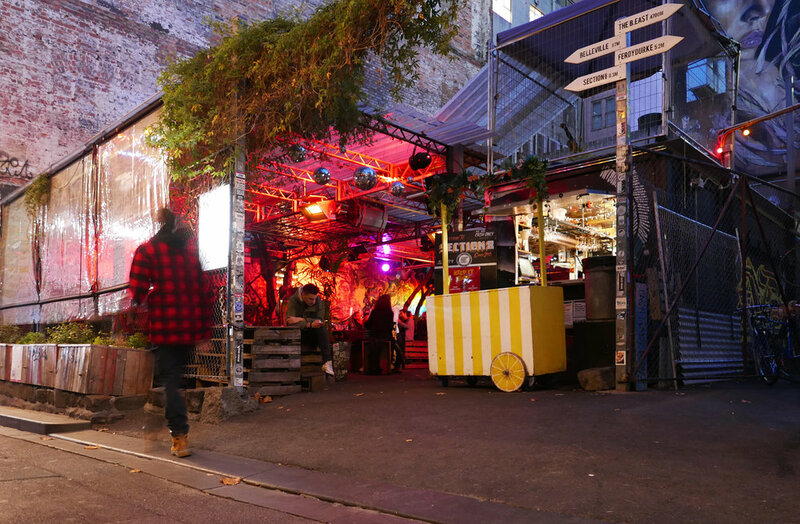 Opening in 2006 the container bar quickly became a favourite with young hip-hop enthusiasts, artist types and anyone who fancied a long neck beer surrounded by Melbourne’s not yet predominant street art scene. Section 8 is sited on a flat bitumen car park in a once-forgotten alley and has a slight incline at the entryway. It uses piled wooden pallets as tables, old drums as stand-up tables and kegs as stools. The toilets at the back are accessible after a L-shaped ramp — it’s wallpapered with pictures of flowers and cats, streetwear stickers and graffiti tags. This outdoor bar is covered and the plants growing through the plastic roofing and the chain-link fence are evidence of its storied past. It’s a cool spot where found objects are repurposed to create a comfortable, human space amongst the concrete — reminiscent of Berlin’s Kreuzberg. It’s dimly lit and there’s a good selection of local and imported beers and cocktails. Section 8 dances like everyone is watching but with a nonchalance that says, ‘yes your fashion has caught up, welcome to the club’. It’s a good spot for a beer on a warm afternoon or a boogie when the live DJs kick off. It’s cash only too so bring old-school, folding money.